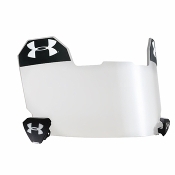 Football visors or eyshields have become one of the most popular football accessories for players of all ages! Football visors are an inexpensive way to look great and protect your eyes and face. Eye shields allow for a clear line of sight and can be adjusted accordingly with weather conditions. Football visors (also known as football eyeshields) can easily fit to most football helmets between the facemask and your face to provide instant protection for your eyes and face with a clear line of sight. High Schools and Youth programs across the country mandate that clear visors must be worn during competition but tinted visors are also available to protect against the sun and reduce glare. Because of the high demand, Endzone Sports stocks football visors from Oakley, Schutt and Xenith to keep our customers happy and protected with the best football visors available!